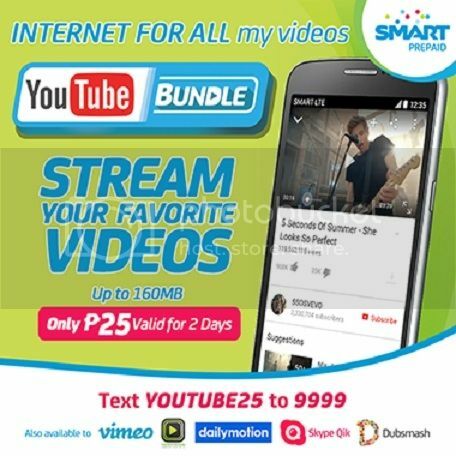 Enjoy anytime access to YouTube, Vimeo and Viewstream on your mobile thru the latest Smart Prepaid Youtube Bundle 5 25 50 199 Promos that offers video streaming for as low as 5 pesos valid for 24 hours. This Smart Prepaid Youtube 2015 Promo allows more mobile fun experience without compromising your existing data subscription. Now, you can watch all the newest viral videos, and other favorites and popular video on Youtube anytime on your smartphone. Take note! Mobile Data usage is subject to the Fair Use Policy. This Smart Prepaid Youtube Bundles 2015 Promo is available while promo lasts.